This year the Hamburg Public Library, one of the hubs for the Buffalo & Erie County library, added a 6,000 square foot modern circular addition to their existing 1966 building. Not only was the expansion a priority but they also wanted to address the perception of a typical library setting. 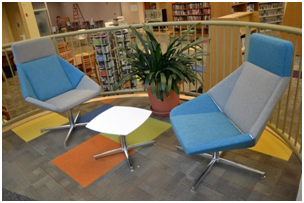 The goal was to bring the library into the 21st century not only with furniture but with a complete change in policy. Transitioning from a strictly quiet and isolated setting to a collaborative, community center was the ultimate wish for the building’s transformation. The library’s director, Jack Edson, had a vision developed over the years from his exploration of some of the worlds libraries. Among his favorite are the Vatican Library, the Bibliotheques Paris and the New York Public Library. Through his inspiration our team was able to further develop the concept that fathered this renovation and see it through to fruition. Since the building has reflective details of the 60’s era it was important that the new design merge seamlessly with the existing mid-century modern vibe while also bringing the library into the 21st century. 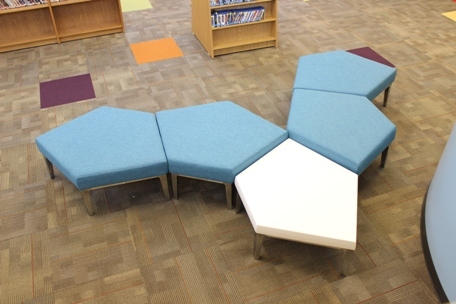 The library still needed to provide the standard functionality that patrons would expect while also attracting a newer generation that desires a sense of community and collaboration. Future flexibility was also an important factor for this renovation. The ability to make continual progress towards creating a destination that fosters creativity and learning was paramount. With the incorporation of a coffee café, teen media and community rooms, the Hamburg Library has transitioned from just a library to a lively community center which now encourages eating, drinking and communication between visitors. With the inclusion of bright colors, an influx of natural light from the skylight and large windows, and new comfortable furniture, the space now boasts a relaxing and inviting atmosphere. The coffee café hosts a whimsical setting alive with color and exceptional artwork intensified by the neutral palette of the HON Flock tables and Haworth Very chairs and stools. 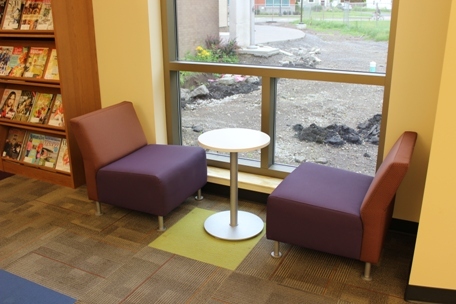 Transitioning from the café to the community room is made seamless with matching Very seating. 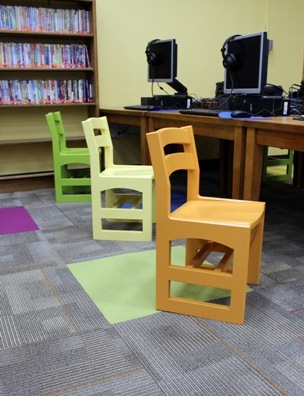 The playful environment of the computer spaces are enhanced with brightly colored Community Classmate II chairs for both adults and children. To aid in flexibility of use the incorporation of Hon Huddle mobile tables allow for conferences, training, and even individual work spaces. Arcadia Nios lounge pieces successfully marry the original mid-century modern design with a more contemporary styling. Their application throughout the space allows for relaxation during collaboration; in the alcoves Nios permits appreciation of nature through window gazing as well as the ability to overlook the pedestrian areas in the library. 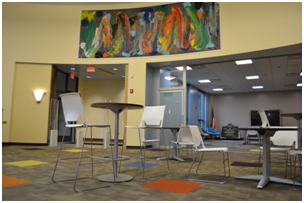 Interactive play and entertainment is encouraged in the teen media room by the movable Arcadia Domo benches, tables and Nios chairs.